Rusty Russ’s minions are fit to be tied. Yesterday I wrote about how Mr. Russ ran scared from a debate with Judge Matthew G. Wright, his opponent for 82nd District Judge, and now all of his flunkies are trying to say it never happened. Well, it happened alright. I’ve now heard from four eyewitnesses, including the elderly man who purportedly caused Mr. Russ to flee in fear (never mind the fact that the sheriff and another cop were in the audience). As you can see from the comments beneath yesterday’s post, Mr. Russ’s cronies know they have a serious problem on their hands. Did they really think I was going to let Mr. Russ run for office without reminding everyone that he is a liar, a cheater, and a career white-collar criminal? In most communities, a reprobate like Mr. Russ would be driven out of town (and in fairness to the First Baptist Church of Franklin, Mr. Russ has been driven out of some places). Mr. Russ and his law partner, however, own the town, the county, the district judge, etc. Even worse, there are a lot of backwards people who keep them (and the rest of the Booger County Mafia) in power. Now I’m not knocking small towns, as I am proud to have grown up in a rural community, namely Union Grove in East Texas (it’s a suburb of metropolitan Gladewater). Nonetheless, as the prophet Peter Gabriel has written, people in some small towns think so small, they use small words. Which brings me to the “Marlin Texas – Current Events, News, and Views” group on Facebook. A couple of people suggested I join, and earlier today I did. I first posted the unofficial and authorized campaign ad at right, and it was quickly removed by moderator Steve Swinnea. We exchanged comments about why it was removed, but I was never satisfied with the answer. Now maybe that spoof ad was just a little too pointed for sensitive folks, and indeed the truth is sometimes painful, so I decided to create something a little more lighthearted, i.e., the “Don’t Vote for a Chicken!” ad above. Not only was the ad removed, I was kicked out of the group, presumably by Mr. Swinnea. Actually, he’s “Dr. Swinnea,” a Ph.D staff member at the University of Texas at Austin, and I’m told he lives in Austin, not Marlin. I suspect Dr. Swinnea grew up in Marlin, not unlike the disgraced former U.S. District Judge Walter S. Smith, Jr. Regardless, Dr. Swinnea should know better. He may not be a faculty member, but he nonetheless works as a doctorate-level employee in academia, and I’m surprised he is so quick to censor viewpoints that he does not like. Then again, I really shouldn’t be surprised, because academia is better known these days for intolerance and closed-mindedness. Maybe small towns aren’t so backwards after all. Yesterday I offered to publish Mr. Russ’s responses to my accusations verbatim. He has a long of history of letting his female relatives and employees fight his fights on Facebook, but he never enters the fray himself. I guess I should not be surprised that he runs away from debates. Anyway, the offer still stands, and I have a challenge for Mr. Russ’s supporters: Rather than casually call me (or anyone else) a liar, send me a sworn affidavit about what you saw at the judicial candidates forum. None of the people who have accused me of lying have bothered to say whether they were in attendance. It’s probably safe to say they were not. As always, feel free to post your comments below. UPDATE 10:57 p.m. ET 02/17/2017: Someone just sent me a screen shot of Dr. Swinnea’s explanation for kicking me out of the Facebook group, including the following comment: “I don’t think the groups [sic] needs many New York attorneys in the mix.” Dr. Swinnea may have a Ph.D., he may live in Austin, and he may work in academia, but apparently he still suffers from small-town small-mindedness. If you want to share your thoughts about censorship with him, his email address is swinnea@che.utexas.edu. UPDATE 11:37 p.m. ET 02/17/2017: The wicked are indeed beside themselves. One of my peeps in Hearne just forwarded the text below, which she said was posted on Facebook by Jan Roe, the former Robertson County Judge. Apparently Ms. Roe is still bitter because I helped drive her from office in 2014. No, I am not an “addict,” but Ms. Roe is a corrupt and thuggish woman, and I will stack my credibility against hers any day of the week. Recall what happened after former Robertson County DA John Paschall pleaded guilty to looting the estate of Marium Oscar: Judge Roe looted it again on behalf of one of her campaign donors — none other than Rusty Russ — then helped sweep things under the rug. Ms. Roe is also famous for talking big on her Facebook page, and then refusing to back it up when she is challenged (she is also begging for a defamation lawsuit). After she was tossed from office, Ms. Roe was elected chair of the Robertson County Democratic Party, and the fact that she supports Mr. Russ so adamantly is telling: Mr. Russ is and always has been a Democrat, like Ms. Roe and all of the other Booger County Mafia kingpins. While I don’t think party affiliation is all that important in a local judicial race, Mr. Russ obviously switched to the GOP only because he thought he had a better chance of winning. I just can’t fathom how people can allow themselves to believe the rantings of a self professed addict, and obviously obsessed, troubled people when they post and write absurdly ridiculous and hurtful things about a man that has been a pillar, a mainstay in our community for his 35 professional years. What can justify turning on this man who has ALWAYS been there for us? You better look within yourselves and ask that. I wonder how many people he has helped, for free and for fee? I wonder how many prayers he has prayed for our sufferings, support he has offered in our troubles? 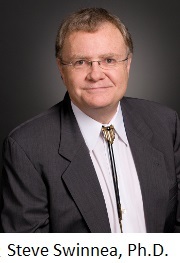 I know he never sought to buy us but I have to ask about the hundreds of basketball, baseball, softball, soccer, Lions Clubs, Crimestoppers, Booster Clubs, Chambers of Commerce, Fair Association, Go Texan, Project Graduations, band, cheer, dance, from every town and school in this County this man has supported for 35 years. He has ALWAYS, ALWAYS been there for this County. That’s the dang point. How much of that support – physical, emotional, professional, spiritual and financial – has anyone in Robertson County every received from the other guy? How in the name of everything good and decent can you justify turning your back on a man that has ALWAYS been here for us – ALL of us. Not only that—HE’S ALSO THE MOST QUALIFIED. I am infinitely aware of the person that has previously threatened Rusty over his representation of the man’s wife in a divorce. I was involved in that litigation with a different firm. The threat was absolutely REAL and substantially menacing. Would you really subject your family and friends, or anyone for that matter, to potential harm for political gain? Do you want to elect someone who would? I truly would rather have a Judge who cares more about doing what is RIGHT than doing what is in his political best interest. And to turn on him because you chose to believe the pure crap and trash that Clevenger and Sharon Jean write. Come on – wake up and look at what that trash has done to our communities. It’s got you turning on someone that has done nothing but help people his entire life. The ignominy is palpable. If Mr. Russ is scared to participate in a political debate where uniformed law enforcement officers are providing security, how in the world is he supposed to preside over a criminal trial? And here’s a challenge for Jan Roe: instead of making vague accusations that others are lying, put your money where your mouth is. Produce some sworn statements from witnesses who back up your version of events, and I will post them here verbatim. Otherwise, do us all a favor and shut that big noise hole. 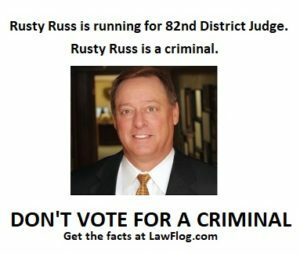 Why did Rusty Russ walk out of the judicial candidates forum?